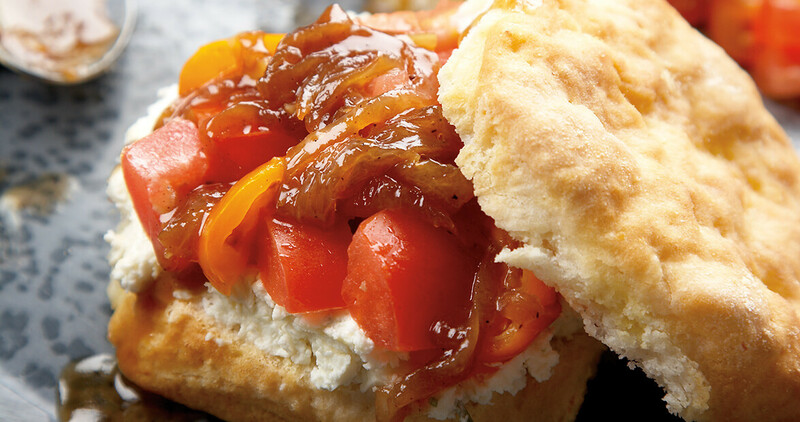 Dust off your mother’s biscuit recipe to make these shortcakes with fresh tomatoes. In a small bowl, toss tomatoes with 1 tablespoon of olive oil and the lemon juice. Season to taste with salt and pepper and set aside. In a large skillet over medium-low, heat the butter and remaining 2 tablespoons olive oil. Add onions, season with some salt and pepper, and cook until golden brown, stirring occasionally, about 10 to 15 minutes. Add in garlic and sugar and cook for 1 minute. Stir in vinegars, scraping up any browned bits, and cook until liquid has evaporated, about 5 minutes. To assemble shortcakes: Split each biscuit in half and spread some Boursin on both sides. Spoon some tomato mixture over each and top with a heap of onion jam.